Customizing color depth in an image can significantly change how it looks by defining the number of bits of data used to represent colors. 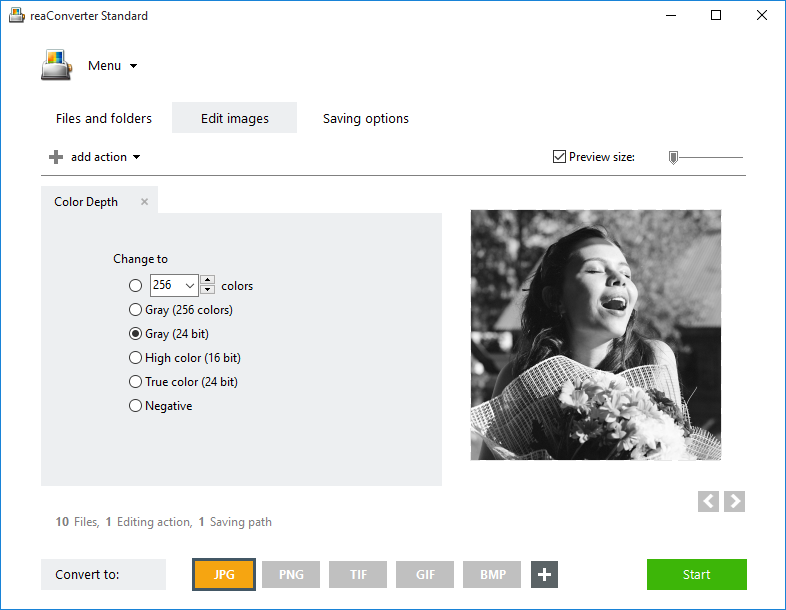 reaConverter's latest editions allows you to do batch modification of color depth for as many images as you want, in no more than 3 simple steps. Also defined as bit depth or bits per pixel (bbp), color depth can be determined by the device used to view a certain image and expresses the accuracy with which colors are rendered on screen. This feature implies the number of color shades and tones that you can view on a particular type of screen. For example, until mid-1990s computers supported an 8-bit color system, which enabled them to display a total of 256 colors. 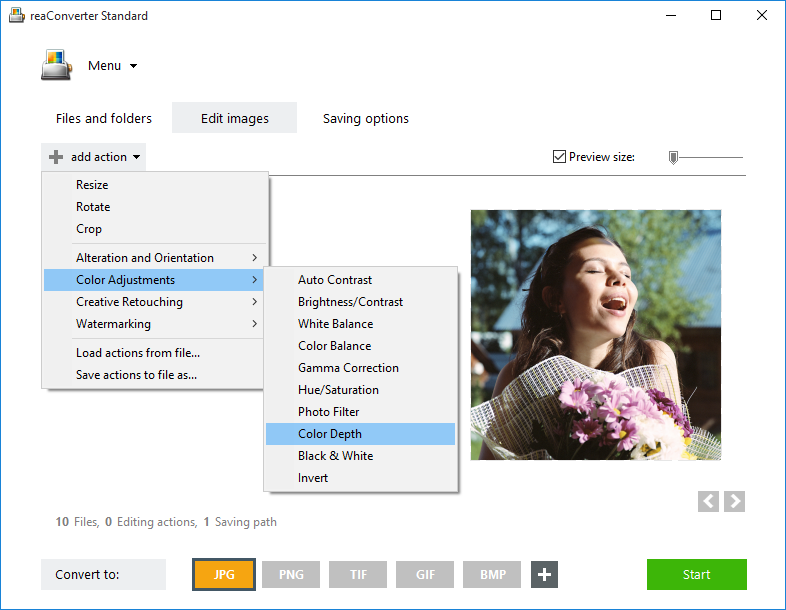 Nowadays, most PCs support a "true color" or 24-bit color rendering, which means they can display almost 17 million color combinations between hundreds of shades of red, green and blue. Changing the color depth of your images is also a great tool for adjusting their size. For example, if you plan to store a large number of scanned documents, it's probably a good idea to decrease their color depth so that they take less space. Open one or more images you intend to customize. You can select them one by one from a location on your computer, add entire folders or use the handy drag-and-drop tool to speed things up. Go to the Edit images tab and click Add action → Color adjustments → Color Depth. In the new window you will find a set of image altering options that allow you to experiment with the number of bits used to represent color values. Depending on your input image, you can increase or decrease the number of colors in the image from 2 to 256. Other options include converting the color scale to gray or to the images' negative. The real time effect of each Color depth choice can be checked in the Preview area, whose size is also customizable. Go to the Saving options and pick a destination for your output images. reaConverter offers several options for saving them locally, as well as online — in your Dropbox, Box.net, SkyDrive or Google Drive account. 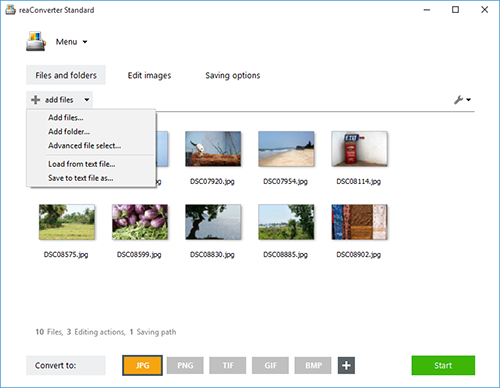 Finally, decide if you want to convert your edited images to a new format. This powerful image handling software supports over 40 types of image extensions, including archaic and rare. Simply press one of the buttons on the bottom of the window, or click the Plus button if you don't see your desired format there. Then just click the Start button and the new files will soon be ready!